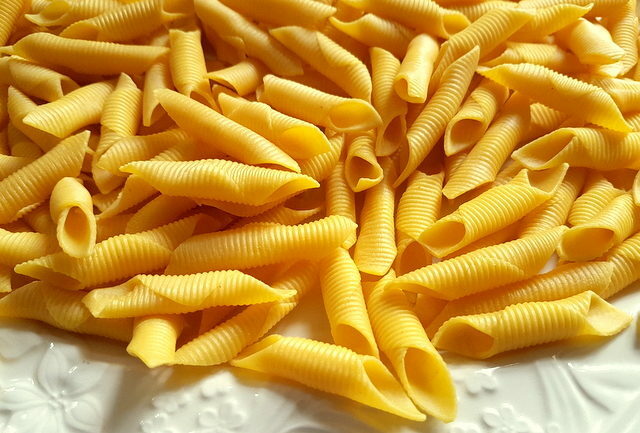 Garganelli, also known as maccheroni al pettine, is a beautiful traditional short egg pasta which originated in Romagna, the south-east part of the Emilia-Romagna region in Northern Italy. 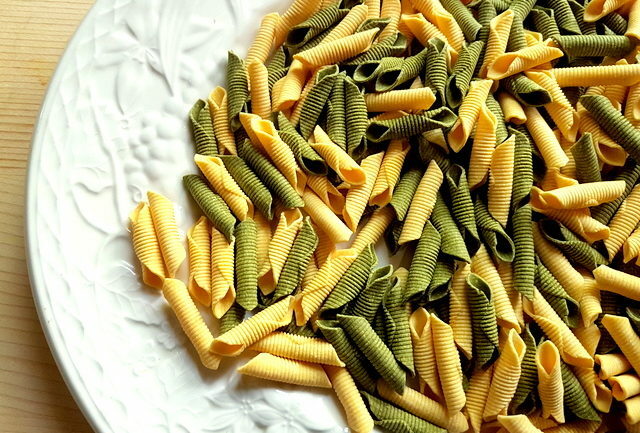 Today garganelli pasta is considered a classic throughout Emilia-Romagna. Like other ancient types of pasta, there are different ‘stories’ about the origins of garganelli pasta. Some food historians say it first appeared on New Year’s eve 1725 at the home of Cardinal Bentivoglio D’Aragona, papal legate to Romagna. Apparently the Cardinal’s chef had run out of filling for the cappelletti pasta that was about to be served at dinner. He creatively invented a new form for the leftover squares of pasta dough by rolling them around a stick and then over the teeth of a weaver’s comb! Or so the story goes!!! Others believe garganelli pasta was actually invented a couple of hundred years earlier by the cook of Caterina Sforza, countess of Forli. In this story, the cook was left without the stuffing for his cappelletti because it had been eaten by a cat! Irrespective of who invented garganelli and why, this pasta became very popular in Romagna and later throughout Emilia-Romagna. It is considered a classic pasta in Emilia-Romagna’s cuisine. In the past, garganelli pasta was a regular addition to capon or beef broths at the tables of the peasant population. 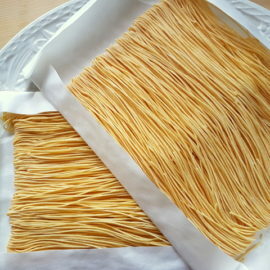 Today, this pasta is more often eaten in what Italian call ‘pasta asciutta’ recipes (dry pasta). Apart from meat based sauces garganelli pasta is also served with seasonal ingredients such as fresh peas, truffles, foraged and farmed mushrooms, pumpkin, Italian chicory (radicchio), shallots, zucchini and zucchini flowers in a variety of vegetarian recipes. Romagna shallots are a very sought after elongated shallot with a sweet and delicate flavour. They are often used in pasta sauces in this region. However, a lot of garganelli recipes also include ham or pancetta. Not so many contain seafood, although I have found some with salmon or prawns. 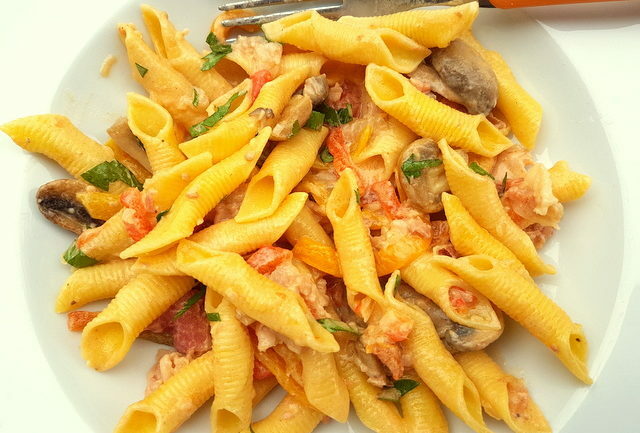 Probably the most popular regional recipes are garganelli pasta with zucchini, saffron and Parma ham or garganelli alla zingara; with bell peppers, mushrooms, pancetta and cream. In Modena, they also serve garganelli with a chicken ragu in a recipe known as ‘alla Rezdora’. Garganelli pasta is still often homemade in Emilia-Romagna, although it’s also available dried. 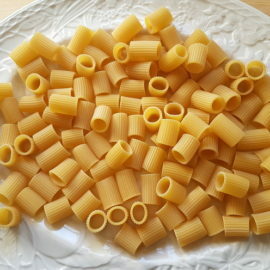 A number of pasta companies, including Barilla produce this pasta. You can also find white and green garganelli, usually sold together in one bag or packet. In Italian this is called ‘paglia e fieno’, meaning straw and hay! 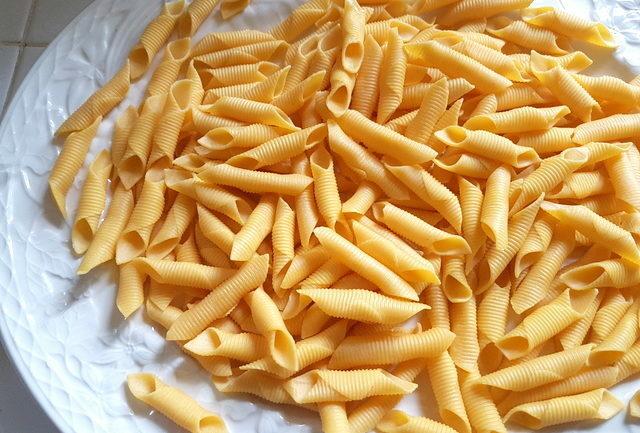 Some people refer to garganelli pasta as a type of penne. In fact, the 2 are quite different. 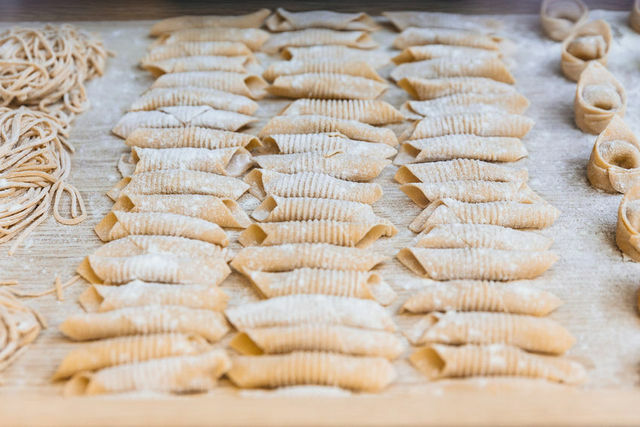 Garganelli are hand rolled and have a seam, whereas penne are extruded and have no seam. 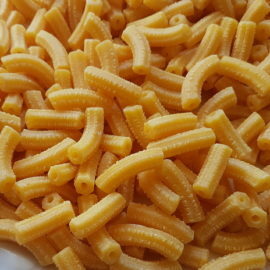 Also the ridges in penne (if you use penne rigate) run the length of the piece of pasta. The ridges in garganelli pasta run around the body of each garganello (one garganelli). When homemade, the egg pasta dough for garganelli sometimes contains nutmeg and Parmesan as well. After being rolled out, it is cut into small squares, about 3-5cms in diameter. These squares are rolled around a stick called a ‘bastancino’. 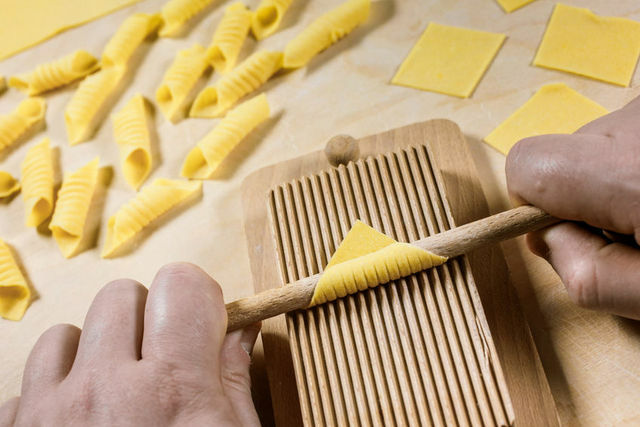 Then the stick with the pasta is rolled over a garganelli board or comb, also called a pettine (which means comb in Italian). This is traditionally a wooden frame with a ridged central part. Some people also use an gnocchi board. You can see how garganelli pasta is made in this video from Pasta Grannies. The first recipe I have posted for garganelli pasta is called ‘alla zingara’. It’s different to the version shown in the video. This is a creamier and more colourful recipe with pancetta and vegetables that tastes absolutely wonderful. Do check it out. I’ll be posting more garganelli recipes soon!